those are cool MRT also has a nice selection of shifter knobs also. My shifter finally came in. However it was not what I ordered. The company is sending me out my correct order ASAP. Here is what I got..
Yeah, online ordering is a hoot. I`m impressed with how good the customer services is. I sent the email out last night and the company responded with in minutes letting me know they would do a rush order. Yesterday I finally got the replacement shifter. Just what I wanted. 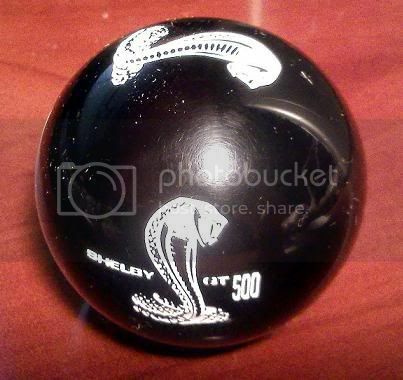 I ordered my shift knob from Grabberpony.com also and I was very inpressed with it when I got it. They do take a while to come but they are worth it. BTW... Welcome to the site Vapor.